Little did I know that I was in for an epic dessert mashup that would take care of every single craving in a single bite. 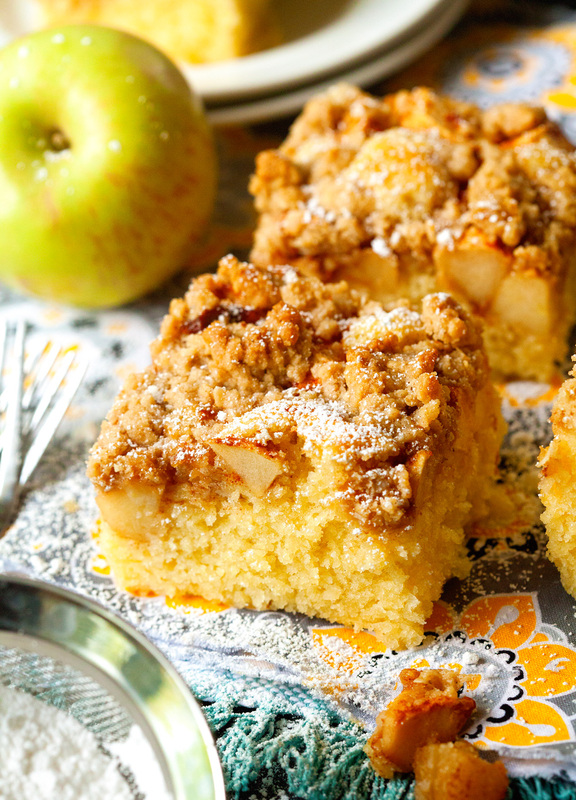 Apple Crisp Cake is truly irresistible. 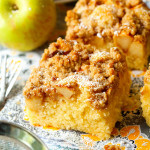 I first started by preparing the crumb topping that is so iconic for traditional apple crisp. Back seven years ago when I had no clue what I was doing in the kitchen whatsoever, I could often be found browsing through old cookbooks and trying to find the easiest recipe with the highest success rate. After many kitchen disasters, I had a knack for spotting no-fail recipes. Sometimes I’d even step out of my comfort zone and try to change up a recipe in order to make it even more foolproof. Pretty funny considering that I know run a food blog. I probably cooked the same dinners week after week for about a year and only knew how to bake chocolate chip cookies and apple crisp. And we’re still not over either of them. After preparing the crisp topping, I moved on to the cake. Which turned out to be one moist and seriously melt-in-your-mouth experience. Yummey. Peeling the apples, and tossing them in wonderful spices with a bit of lemon juice, is the last step before putting it all together and placing it into your oven. You will need to constrain yourself from cutting straight into it and stealing a corner as soon as the cake has finished baking. 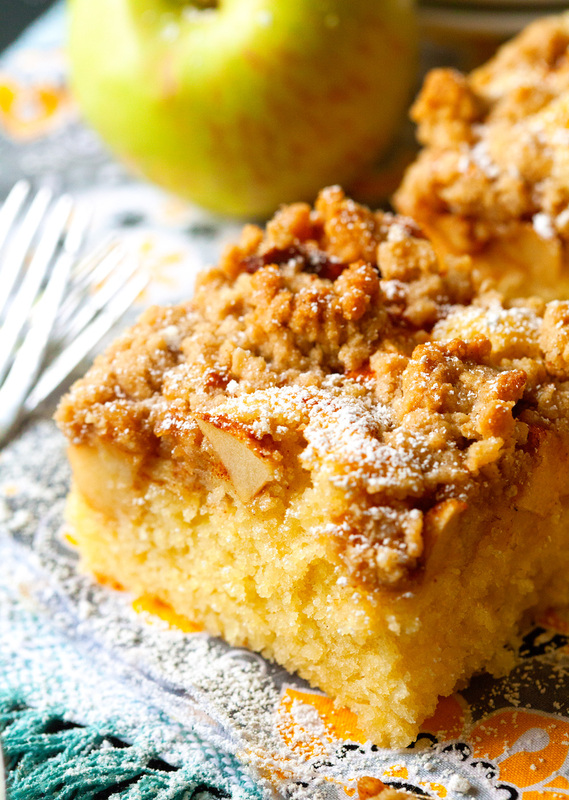 The amazing aroma will drive you crazy and you might even start to circle the apple crisp cake. Just give it a couple of minutes, let it cool, add powdered sugar and then enjoy slice after slice. You won’t be sorry you did. It’s so, so worth the wait! I think you need this dessert in your life to make it through the rest of the week. Hope you enjoy! 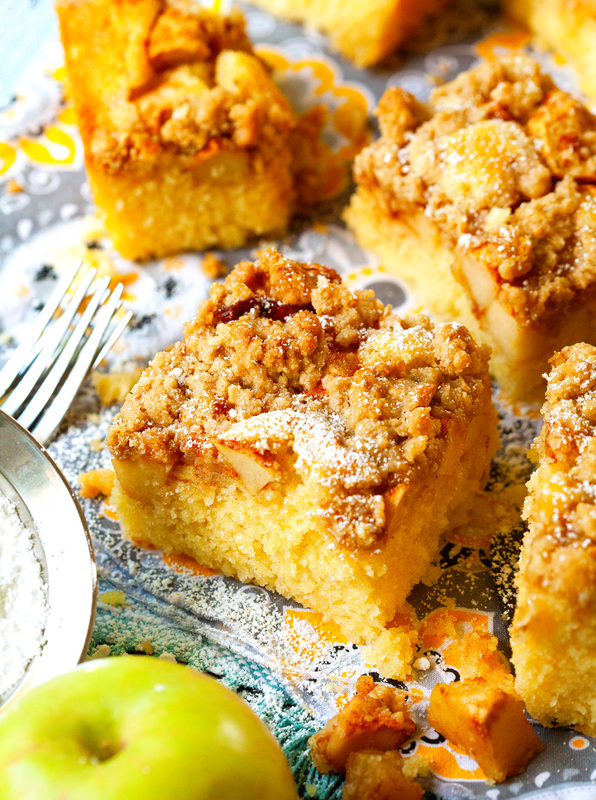 Apple Crisp and made-from-scratch yellow cake create an amazing mashup. This dessert definitely delivers that wow factor. Preheat oven to 350 degrees F. Spray a 9-x-13 inch baking pan with nonstick spray. 1. Cut butter into pieces and place in a medium bowl. Add brown sugar, flour, oats, salt and cinnamon. 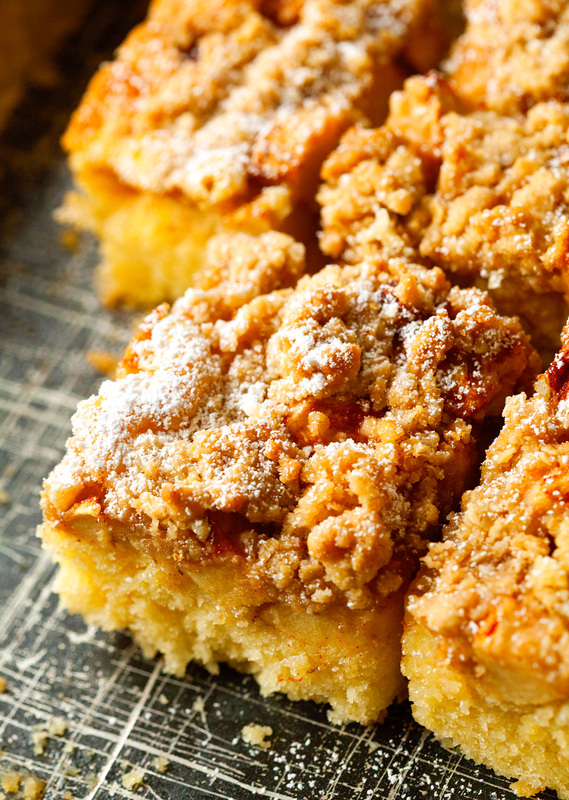 Using a pastry cutter (or your hands), mix together until coarse crumbs form. Set aside. 2. In the bowl of your stand mixer, cream together butter and sugar until light and fluffy, about 4-5 minutes. One at a time, add eggs and egg yolks and mix until fully incorporated after each addition. Add vanilla and give it a good stir. Mix in baking powder, salt and half of the flour and stir until combined. Add half of the milk and incorporate. Finally, add the remaining 1 1/2 cups of flour and mix until combined. Pour in the remaining 3/4 cup milk and mix until a smooth batter forms. Pour into the prepared baking pan. 3. 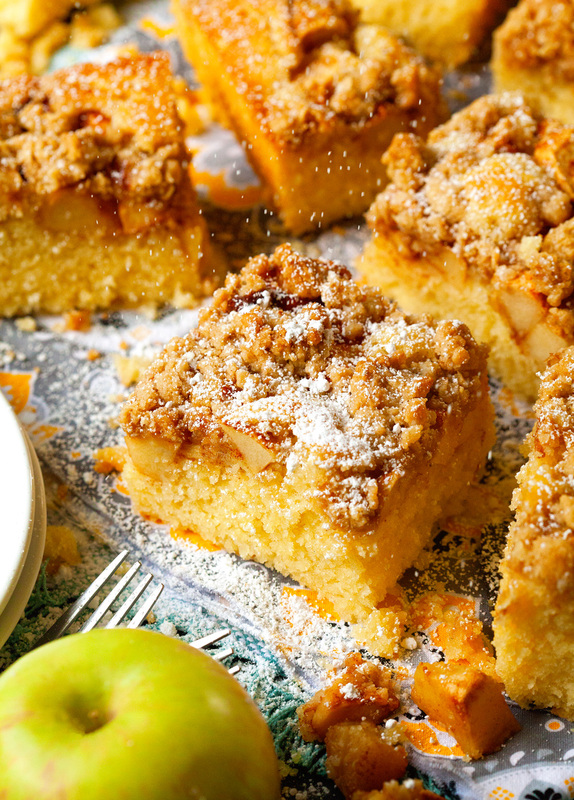 Place cut apple chunks into a medium bowl and add brown sugar, cinnamon and flour. Toss to coat apples evenly. Pour lemon juice on top and give it a good stir. 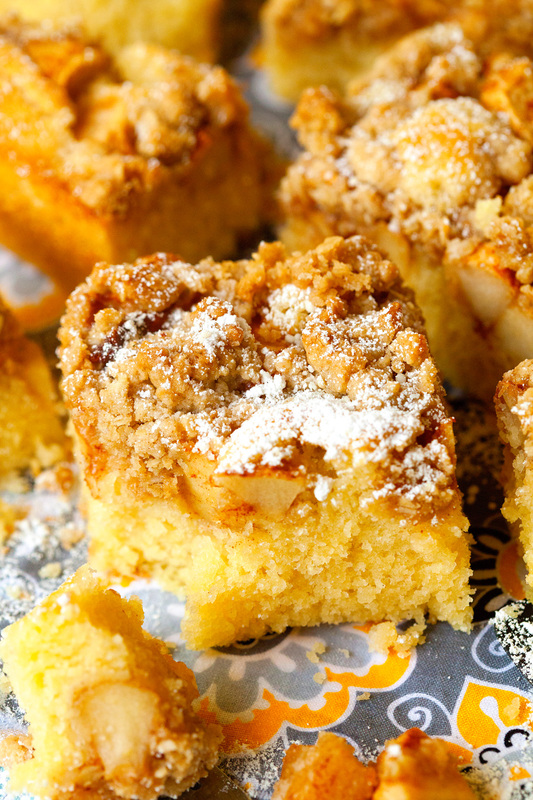 Arrange apples onto the cake batter in the pan in an even layer. Sprinkle crisp topping over the apples and place in the oven. Bake for 60-70 minutes or until a toothpick inserted in the middle comes out clean and cake appears to be set. Remove from the oven and let cake cool for at least 1 hour. Cut into slices and dust with confectioner's sugar, if desired. *cake recipe adapted from marthastewart.com.